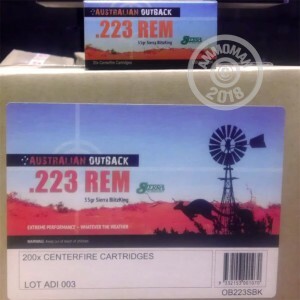 Whether you're dealing with coyotes or kangaroos, this Australian Outback ammunition from ADI Munitions (an Aussie defense contractor) will get the job done. Each cartridge in this box of 20 fires a standard weight 55 grain version of Sierra's BlitzKing polymer-tipped hollow point bullet. The BlitzKing is designed to provide pinpoint accuracy backed up by explosive expansion for quick kills against varmints, making it a great choice for .223 ammo. The signature feature of Australian Outback ammo is "Ballistic Temperature Independence." Developed with the highly variable temperatures found "down under" in mind, this ammo uses propellants formulated to produce consistent ballistics regardless of external conditions. This gives you the ability to sight in your rifle and depend on that zero to serve you well at all times. In many parts of the US as well as in Australia, BTI can mean the difference between a live varmint and a dead one! These cartridges come in boxes of 20 and use non-corrosive Boxer primers and brass cases.